The use of coercion is one of the defining issues of mental health care. Since the earliest attempts to contain and treat the mentally ill, power imbalances have been evident and a cause of controversy. There has always been a delicate balance between respecting autonomy and ensuring that those who most need treatment and support are provided with it. 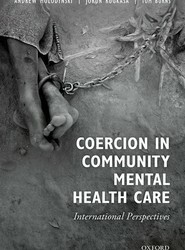 Coercion in Community Mental Health Care: International Perspectives is an essential guide to the current coercive practices worldwide, both those founded in law and those 'informal' processes whose coerciveness remains contested. It does so from a variety of perspectives, drawing on diverse disciplines such as history, law, sociology, anthropology and medicine to provide a comprehensive summary of the current debates in the field.